Floor Tile and Grout Cleaning By Complete Carpet and Tile For Just $49! Will Travel Throughout the Conejo and San Fernando Valleys. Important notice regarding natural stone floors: Natural stone floors must be resealed after cleaning. Need more than 250 sq. ft. cleaned? Conejo Deals members pay just .70 cents per square feet for additional square footage. Tired of looking at the filthy grout between my kitchen floor tiles, I placed a “you gotta get a deal for” call to Chelsea, our superstar deal getter. 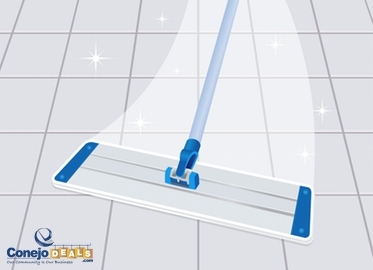 Faster than you can say “Wipe your feet before you walk in the house,” she had a great Conejo Deal for floor cleaning with Complete Carpet and Tile Care. For just $49, members get 250 sq. ft of tile and grout cleaned! And if you have natural stone floors (like travertine or another natural stone), Complete Carpet and Tile will clean, condition, and reseal your floors for just $149!